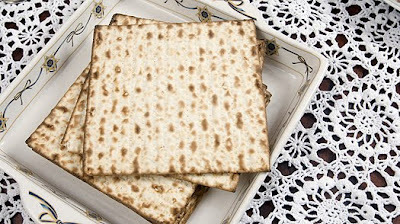 Time has posted an article online, So You Think You Know Matzo?, mentioning the "20 Things To Do With Matzah" video I made with Michelle Citrin. And, this Passover, our video has received over 1,000,000 views on YouTube! Meet Billy, son of Simon. 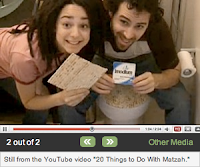 Simon edited our "20 Things To Do With Matzah" music video, as well as Rosh Hashanah Girl and Pass The Candle. 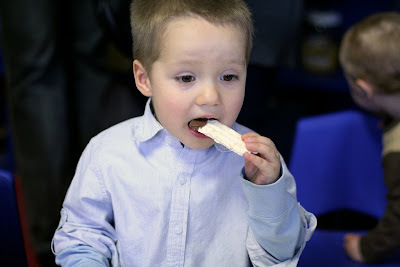 This is a photo from Simon's blog, of Billy's first Passover party at preschool here in Brooklyn. According to Simon, Billy prefers to strip and eat the chocolate off the matzah, leaving behind the flat, unleavened bread. At least we know what he can do with all that leftover matzah! See more photos, and help Simon solve the mystery of the frogs. JTA, one of the sponsors of the Pass The Candle music video I made with Michelle Citrin for Hanukkah, was busy this week with articles and blog posts about Jewish videos for Passover. Author Amy Klein took an in depth look at the reasons behind the Jewish YouTube craze in her article, Let my people post Passover videos, where she interviewed Michelle about our Matzah Song, and followed up with a Top 10 list, 10 YouTube videos for Passover, (which I'm surprised failed to mention my Shabot 6000 "Seda' Club"), placing our "20 Things To Do With Matzah" at the #1 spot. 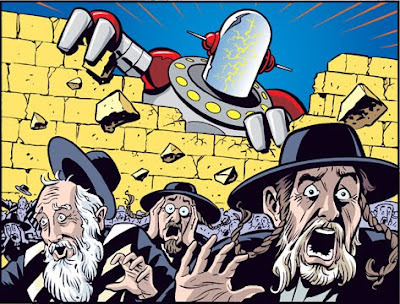 And as a bonus, a JTA blog post, Two more Passover videos, by Ami Eden, gives a shout out to Bitter Herb. Thanks for all the attention, JTA!